The texts that have brought me the most enjoyment and fascination have always been those that confront me with an inscrutable strangeness while themselves modeling encounters with the ineffably strange. For me, these push the boundaries of the act of reading and somehow make me feel changed from having read them. Viewing Mushishi definitely fell into this category of experience for me. This anime consists of a series of 26 stories that are mostly self-contained and set in what seems to be the late Edo period (though some of the clothing seems anachronistic in places). 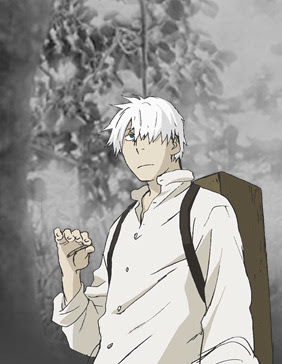 The main character is a peripatetic wanderer named Ginko whose profession as "Mushishi" impels him to catalog and contain the Mushi, a life form that both precedes and exceeds our known spectrum of living beings. In the first episode, Ginko describes them with a curiously recursive anthropomorphic analogy: if humans are represented by the middle finger of the hand, which is the furthest point from the heart, and microbes are at the base of the wrist, then the Mushi would be somewhere near the chest. 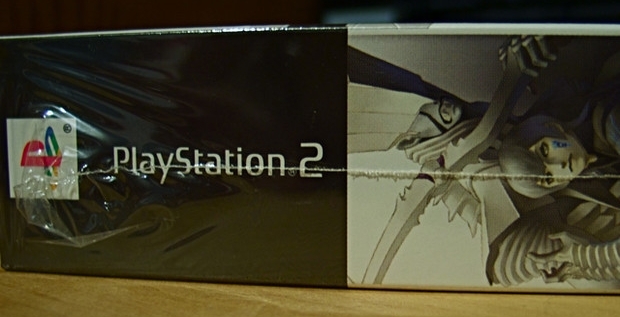 Sounds fairly formulaic enough, until our first encounter with the Mushi actually takes place. Their first visual appearance occurs in a scene where a child, practicing his calligraphy, watches with exasperation as his Kanji once again float off of the page and prance around the room in a growing parade of loping life forms. This same trope of "living writing" recurs in one of the final episodes, as does another materialization of the Mushi: as a parasitic inhabitant of the human eye. I think these are very purposful "bookend" parallels but haven't been able to fully analyze their significance yet. In any case, this isn't your typical series of ghost stories. Each episode consists of increasingly bizarre manifestations of the Mushi and the situations they create for their hosts, or the society that surrounds the host. Sometimes these situations are seemingly symbiotic, only to reveal deeper problems that have gone unaddressed in the host or his surroundings. At other times an initially hostile infection or possession by Mushi comes to be understood as the correct course for all involved. This isn't as clinical or strictly parasitic as my description might sound, however. The series inhabits an entrancing gray area between zoology, epidemiology, and mysticism, something I haven't experienced since Princess Mononoke, and a few other works. For instance one of the later episodes portrays a seaside village where those who are known to be on the verge of death are sent to an offshore site to be "offered" to the ocean which, on a full moon, will produce small egg-like spheres. A mother is then chosen to ingest one of these eggs and give birth to their "revived" relation. Ginko of course eventually discovers that a form of Mushi is producing these eggs which contain a homunculus-like replica of the living being that was absorbed. The protagonist is called to the village by a woman who struggles with a bit of an identity problem. She has given birth to, and is raising, her own mother, which occasions questions of teleology, the limits of parental love, immortality through progeny, the profound yet familiar "otherness" of one's own child, and so on... I could write an article for each of these episodes, to be honest, so I'll end the synopsis here. The Mushi and the underground "lifestreams" that they cluster around are as alluring as they are absolutely uncaring, often forcing the character into a tricky negotiation between transformative fascination and self-preservation... one that sometimes pushes the boundaries of what it means to be human. This simultaneous dwarfing and integration of the individual into the scale of an unfathomably uncaring yet absolutely living universe reminds me somewhat of the concept of the Sublime in the philosophy and aesthetics of the Romantic period, namely that of Arthur Shopenhauer in The World As Will and Representation. But this concept in western philosophy gained much of it's ideological heft by centralizing the self and it's pursuit of this experience, that of it's own staggering insignificance in relation to the larger external world. In the narrative of Mushishi, the self is usually woven into a larger social fabric, whose intersections with the Mushi are quite a bit more complex than a generalized feeling of wonder and individual insignificance. The Mushi operate as protonatural "drivers", functioning both as a trope that mirrors human problems and as a catalyst toward achieving a certain balance or homeostasis in the character's interaction with extra-human forces. Where the western sublimist would place the distinct self against a limitless background, the brand of sublimity in Mushishi posits a complex social self in the gravitational pull of an unknown, but constantly interactive, transformative, and sometimes destructive, attractor which is equally boundless. This sublimity is truly stunning to experience. With each episode, I've felt compelled to write something until the conclusion of the series essentially obligated me to put something here. Though I feel that I might have diluted the experience of the show by academically blathering about it at such length, I do encourage any thinking reader/viewer with an analytical bent, a penchant for the sublime, and an open mind, to seek out this series in whatever format they can. They won't be disappointed.